A cyclist on a bike lane in Copenhagen. Photo by Quiltro Elemento, via Flickr. Click above to see the photo on Flickr. I’m a sucker for black-and-white — the preferred language of my high school photography teacher, Mr. Gregory. 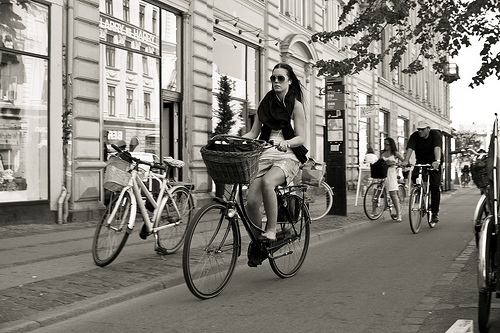 So it was hard to resist this photo I found on Flickr, taken in the extremely bike-friendly city of Copenhagen. It’s nicely composed and there’s something striking about the woman in the sunglasses. As I’ve written a lot recently, we are trying to spiff up The Source with more visuals and it’s my intention to run images involving transportation almost every weekday. The idea is to document how people both in Southern California and around the world get from Point A to Point B. Feel free to submit your photos by posting them to Metro’s Flickr group or you can email them to us at thesource@metro.net. Does the photo have to be of a train or bus? No. The posts are called “the art of transit” but that’s a loose definition. Fred and I are pretty open-minded and by posting each day, there’s plenty of room for variety. To see other recent images, click on the category “art of transit” below.